We’ve heard a lot of speculation lately about a blue wave. What isn’t a matter of speculation is that there is a women’s wave occurring. A record number of women are running for office in Pennsylvania as well as many other states. Currently, Pennsylvania ranks 49th out of 50 states for representation of women in office, and is currently one of 11 states with no women serving in Congress. With 126 women on the ballot statewide, including PA-5 Congressional nominee Mary Gay Scanlon, we have a chance to remedy that position, although it will take more than one election cycle to achieve gender parity in Pennsylvania. Mary Gay Scanlon (fourth from left) is one of 126 women on the ballot statewide this year. 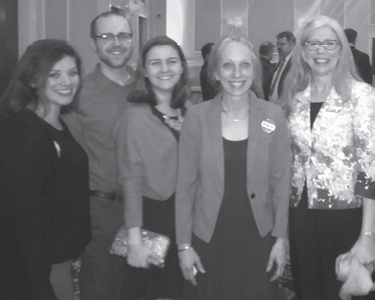 In June of 2018, the Delaware County Democratic Party elected Colleen Guiney as chair, reflecting the increasing role of women at the local party level. Guiney has quickly swung into action in several exciting races, including Kristin Seale’s in the 168th and Jen O’Mara in the 165th. Lansdowne, ahead of the trend as always, elected Margo Davidson to the 164th in 2010. But we need many more women in the state house, to pass bills like Leanne Krueger-Braneky’s #metoo legislation. This bill, HB 1965, would ban non-disclosure agreements and the use of taxpayer funds to settle harassment lawsuits. Pennsylvania ranks 49th out of 50 states for representation of women in office, and is currently one of 11 states with no women serving in Congress. If you’re active in committees and activist spaces in Delaware County, you know that women are well represented in leading and attending grassroots organizing meetings. Organizations like Reclaim, Delco Coalition for Prison Reform, SURJ SEPA, Grassroots Delco, Women’s Democratic Club of Delaware County, Haverford Community Action Network (H-CAN) and Delco NOW are all dynamic organizations with women in leadership positions. These organizations are pushing forward a large slate in of progressive issues in Delco and challenging the remaining GOP structure. Those of us who are active at the polls have the opportunity to talk with voters and have heard men and women alike continually express the desire to vote for women and achieve gender parity in representation in PA. It all starts with individual voters determined to show up and pull the lever!